CITY of Plymouth’s Emily Bee added another national medal to her collection at the weekend. Bee took silver in the girls’ 80m hurdles event at a wet and windy England Under-17 Championships at Bedford on Sunday. The medal followed on from claiming hurdles gold at the SIAB Home International in Scotland and silver at the English Schools’ Championships. She also won gold in the pentathlon at the England Indoor Championships at the start of the year. Bee, who is ranked number one in the hurdles and heptathlon in the UK this year, was just denied gold in Bedford by her big rival Marcia Sey. Sey had also won gold at the English Schools’ Championships, but Bee had beaten her to the top of the podium at the SIAB International. 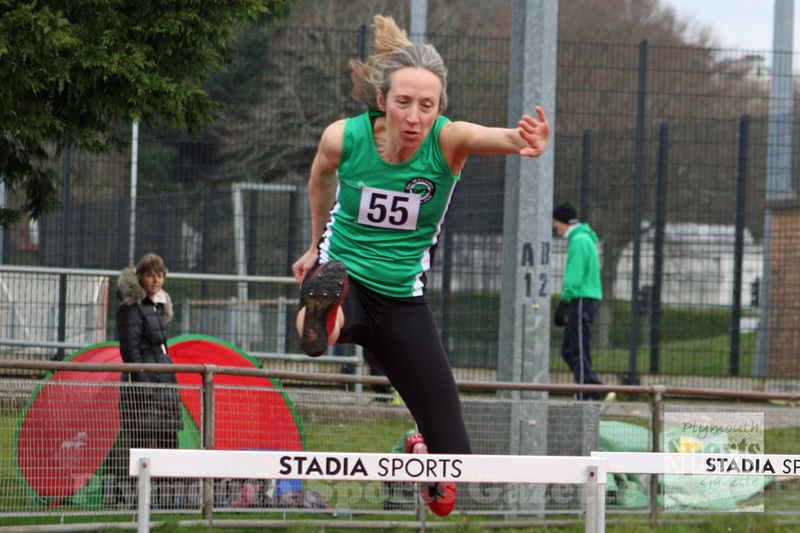 The hurdlers had a tough afternoon on Sunday. They had to run three races within three-and-a-half hours in rain and into a strong headwind. They had little time to recover between the heats, semis and finals. Despite the conditions and tough schedule, Bee ran 11.29 seconds in the final. She had earlier run 11.53 in the semis and 11.76 in the heats. Her PB, achieved last month, is 11.02 seconds, which ranks her joint third on the UK’s all-time list. 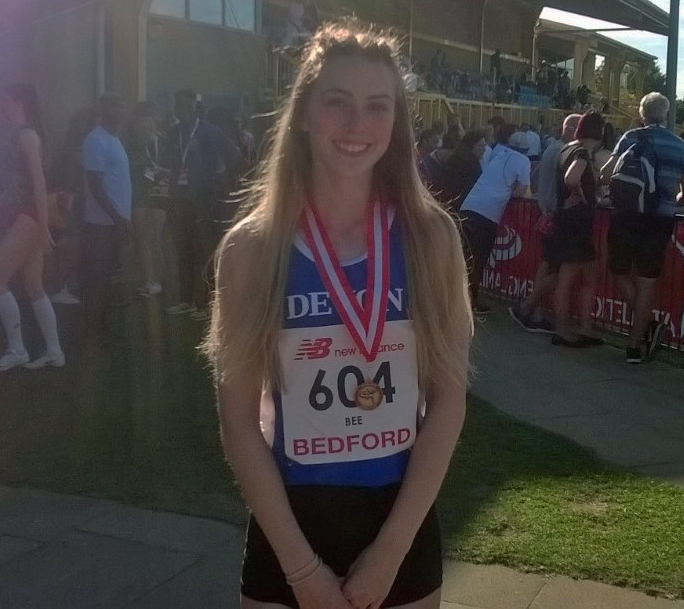 Bee will complete her outdoor season at September’s English Schools’ Combined Events Championships. Tavistock’s Jamie Bulbring and Harry Tomlin and City of Plymouth Ben Foster also competed at the UK Under 15 and Under-17 Championships at the weekend. Bulbring qualified for the final of the under-15 girls’ 200m with a 26.70 second run, she also ran 12.90 seconds in the 100m. Tomlin threw of a PB of 44.66m to finish seventh in the under-15 javelin, while Foster finished 11th in the under-17 shot put with a best throw of 12.85m. Meanwhile, fellow City of Plymouth athletes Simon Anderson and Tamzin Gribble competed at the British Masters’ Championships in Birmingham at the weekend. Anderson is a former world and European masters champion, but he had to settle for fifth in a strong over-50s 1,500m final. Anderson, who is in his fifth and final year at over-50 level, clocked 4:35.44 minutes. The City of Plymouth star will be encouraged for next season by the fact that the over-55 final was won in 4:42.72. Gribble finished seventh in the over-45 women’s 100m with 14.91, but did win silver in the 400m hurdles in same age group with a 79.15 second run. Elsewhere, a number of youngsters from the region attended Newquay & Par’s Sprint, Jumps, Relays & One Mile Open meet. City of Plymouth’s Jed Hutchings claimed three PBs on the day. He ran 14.7 seconds in the under-13 boys’ 100m, jumped 1.30m in the high jump and ran 5:25.9 for the mile. 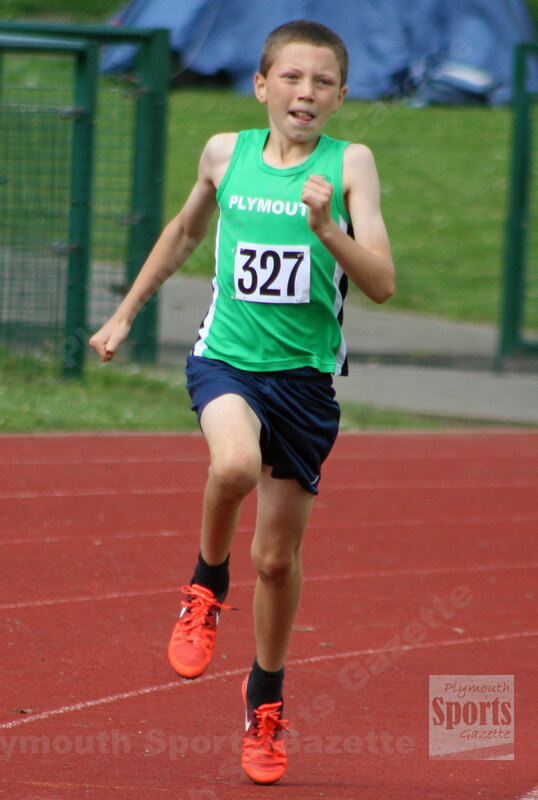 Also at under-13 boys’ level, Tavistock’s Nicholas Maczugowski ran 15.0 seconds for the 100m, a season’s best of 30.00 for the 200m and jumped 4.24m in the long jump. In the under-13 girls’ events, City of Plymouth’s Emily Ginter ran 14.5 seconds for the 100m, with Tavistock’s Grace Wonnacott and Charlotte Walker clocking 14.7 seconds and 15.5 seconds respectively. Wonnacott ran a PB of 30.9 seconds for the 200m, where City of Plymouth’s Mali Heard ran a quick 28.4 seconds. Charlotte Walker claimed another PB of 33.8 seconds. Heard also leaped 4.20m in the long jump. Hannah Walker ran 6:32.0 for the mile and leaped 1.20m in the high jump. City of Plymouth’s Lili Fern ran 13.5 seconds and 28.4 seconds in the under-15 girls’ 100 and 200m respectively, while team-mate Erin Muldoon recorded 1.45m in the under-15 high jump and Summer Dawe clocked 14.6 seconds for the 100m and leaped 3.73m in the long jump. City of Plymouth’s under-20 athlete Benny Monguilo ran 12.1 for the 100m and 24.9 seconds for the 200m.